Well you’ve finally turned your calendar over to February (what happened to January anyway? ), which means that next month is March, which means Spring Break and kids out of school! Time to start checking out some camps. If your kids have always loved the pony rides and squeal every time they drive by horses, might be time to check out True North, located in Kula. This spring, they are offering two weeks of camps, for ages 5-12. Through horse-related games and activities, campers learn about the care of horses, their characteristics, breeds, colors and safe handling – both on the ground and in the saddle – in a fun-filled environment. 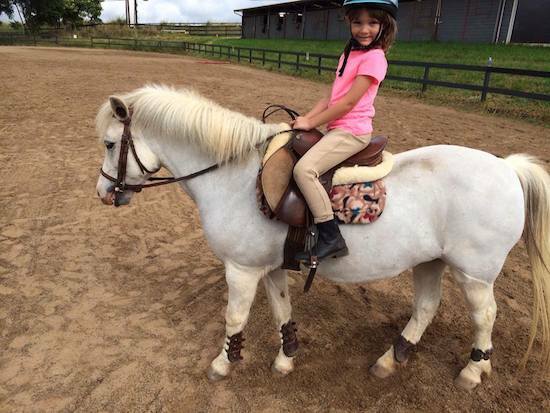 The camp is designed for all levels of riders, from the first experience on a horse to experienced junior riders. Due to the limited number of riders per session – call soon to book your child’s spot! Waiting for Santa! With camp assistant Malia! Over the Christmas Camp they dressed up the horses and made stockings and treats for all the horses! Learning how to take care of horses! Want to see more? Check out True North on Facebook. Do you know of other spring break camps? Send me an email – contact info in the About Maui – with the details!